Linear models of designing and producing clothing, plastics, electronics, and other goods have been led by high-income countries: the supply chains for goods consumed by the richest 10 percent of the world’s population are associated with 50 percent of carbon emissions. Yet, the resulting climate change will drive more intense droughts, floods, and heatwaves everywhere, particularly in countries with the fewest resources to adapt. For everyone’s benefit, the world’s supply chains and the hundreds of millions of people employed by them need to shift towards a circular approach that targets zero waste and minimal impacts. A smartphone designed for repair and recycling decreases mining for minerals in conflict-prone areas. Clothes made with renewable fabrics that can biodegrade will not require petroleum or landfill space. Shifting business models from frequent purchases to goods for local repair, rental, or reuse reduces the number of products that need to be manufactured or transported in the first place. Finally, choosing materials produced and recycled with zero-carbon energy lowers the carbon footprint for all products or later uses. 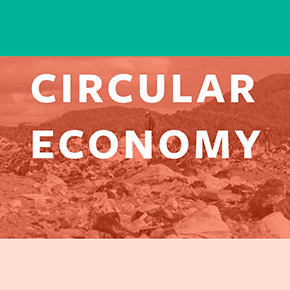 Building a circular economy will require changes in product design and business approaches that have ripple effects throughout supply chains and economic systems.